Warming up and stretching before the workout. Getting ready to throw down a tough one! And while that may be true (Hah! ), that’s not the case with today’s post about how to work out with your kids and what can happen with it! Saturday morning, I was planning on doing a sprints workout. Sprinting is an awesome form of exercise – I know a ton of exercise and movement mavens who put it in their top three exercises/movements to do for total body health and improvement. It builds strength and lean muscle, it increases endurance, it promotes human growth hormone production, and you can do it anywhere – and quickly! So I came downstairs, chatted with my family for a bit, and then announced I was heading out to run. My son asked “Can I come, too?” And of course, my response was “yes! Go get your shorts on!” So Duncan ran upstairs to get dressed – put on his athletic shorts, a t-shirt from a race he ran, his shoes, and we headed out to a nearby baseball field. Since I haven’t run sprints in a while, I did a lighter sprinting workout – two half-speed “warm-up” sprints of about 50 yards and then five at full-speed. The thing with sprints is that you don’t have to time yourself, or anything: you just have to run as fast as you possibly can. Period. It’s that complete effort that brings the results. Duncan and I set up our course (using two cones we found at the baseball field, thank you Mr. Serendipity) and then we did our warm-up and our light stretching (Grok Squat and others). Then Duncan told me he wanted to do the starter sound (like he hears at my wife’s and daughter’s swim meets) and I told him that was a good idea. So, with a “take your mark…BOOP!”, we were off! We had a ball! We high-fived each other and I cheered him on and the whole nine yards, and I got a great workout in while having fun with my son. So here’s the issue I see with people who tell us they don’t have time to work out: they aren’t thinking outside the box enough. They think that workouts mean treadmills in the gym (or even at home, if they haven’t converted them to clothes racks yet), or having to go to a zumba class, or weightlifting routines that take an hour and a half, or whatever. And while many gyms do have child care and such things, I think there’s a lot to be said for including your kids in your workouts! You’re creating the best example you can and increasing your kids senses of self-worth. And you’re also creating a bond with your kids that they did something you did and you wanted them there – that they weren’t just in the way. Body-weight workouts on a playground – they can play while you do pull-ups, squats, push-ups, whatever. 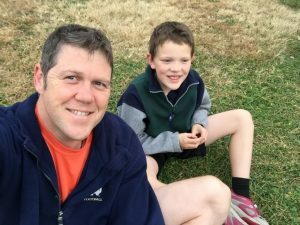 Running – if your kids are a little older, they can run with you and even train for family races. There are a ton of fun races that you can do with the family these days like Color Run and such. MovNat workouts – what could be more fun for kids than running around in nature! Climbing, crawling, swimming, hanging, all sorts of natural movement is great for kids. And, you might even learn something from them in this regard! Changing your mindset on workouts from gyms to outdoors and including your kids is a great way to improve all sorts of facets of life! So how can you get a workout with your kids? Share some of your ideas below! And if you liked this article, please share it! ← Coffee-Plus: It’s What’s For Breakfast! Any link to Amazon.com or The Primal Blueprint from any post is an affiliate link, which means I will get commissions from your purchase of any item using that link.